All squash varieties are members of the Curcurbita family. They come in varying colors, textures, shapes, sizes, and a range of flavors. Squash is a low carbohydrate food, including a low glycemic index food, between 0 and 35. The low number indicates no spiking of insulin in the blood stream. Most squash have small amounts of vitamins A, C, E and K, and including the B-vitamins. They also contain trace minerals including iron, calcium, magnesium, potassium, zinc, and copper. Squash is great for heart health and every muscle of the body. Magnesium is great to help the muscles relax, preventing what is called charlie-horse or cramping of the muscles. As for potassium, one half cup serving of Grey Squash as an example has 603 mg, raw zucchini has 459 mg, cooked has 194 mg, and baked Butternut squash has 289 mg. The squash we are using in our featured recipe is a hybrid of the zucchini squash, and is referred to in Mexico as the Mexican squash or the grey squash. The grey squash has the same texture and flavor as the zucchini. 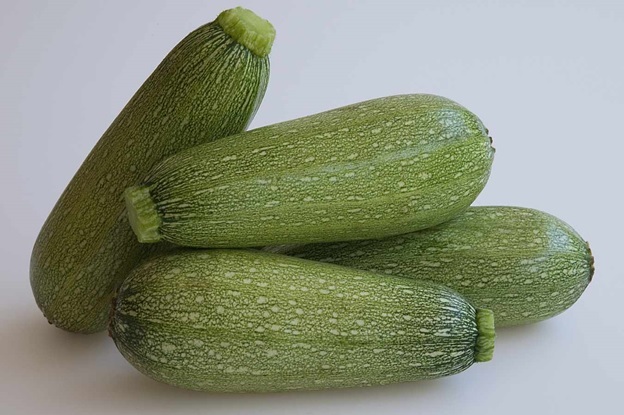 Unlike the zucchini when harvested at a larger size, the grey squash tends to still have a tender skin. 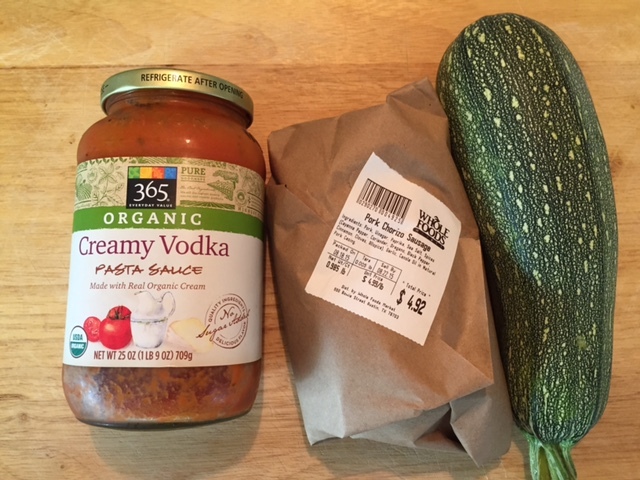 You can use any type of spaghetti sauce, but we chose to use a tomato base with cream and vodka included, 2 cups. One pound of organic pork chorizo, which we purchased on sale at the Whole Foods Market, and 3 Mexican squash, which will make about 2 to 3 servings. Here we have a larger harvested Mexican squash given to us from a friends organic home garden. 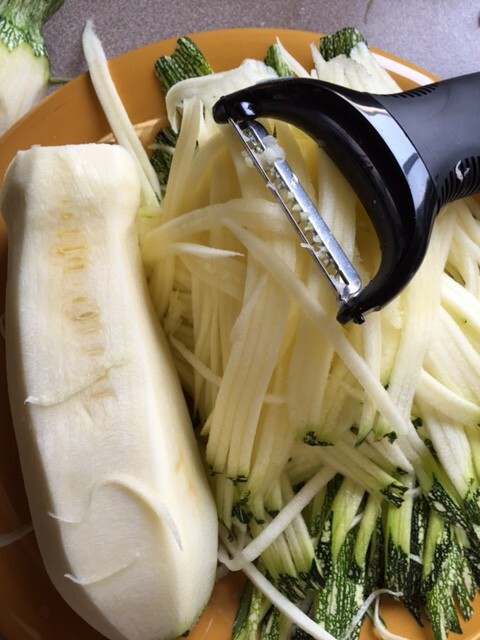 Using a julienne peeler, run it from top to bottom all around the squash until you arrive to the seeds in the center. Set the squash pasta aside. Heat a large ceramic coated skillet over medium heat, add a tablespoon of pastured unsalted butter, and when melted add the pork, and cook until done, about 10 minutes. remove from heat, and set aside. In a large ceramic coated skillet over medium heat, add 4 tablespoons of olive oil. When heated, add the stringed squash and cook for about 5 minutes. You want the oil to cling to the squash strings. 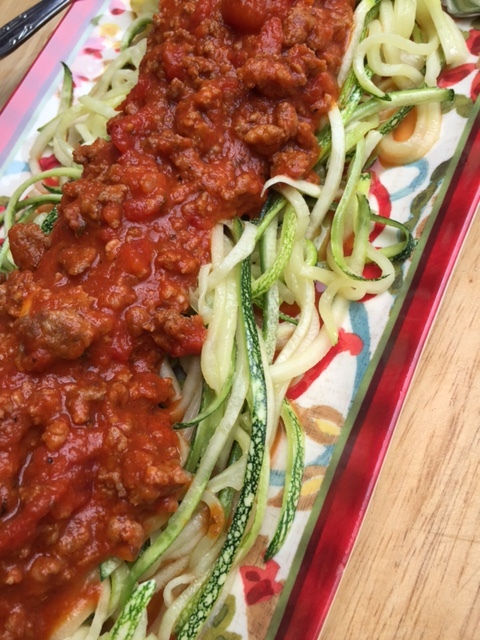 If the oil clings then in turn the spaghetti sauce will cling to the squash pasta. 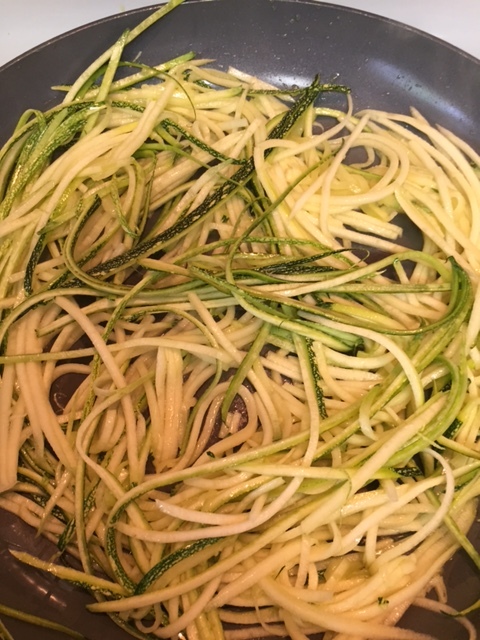 Do not over cook the squash, you want a little crunch, and at the same time you want a fork to twirl it, the same as is done with traditional pasta. Remove skillet from heat and transfer squash past to a serving platter. 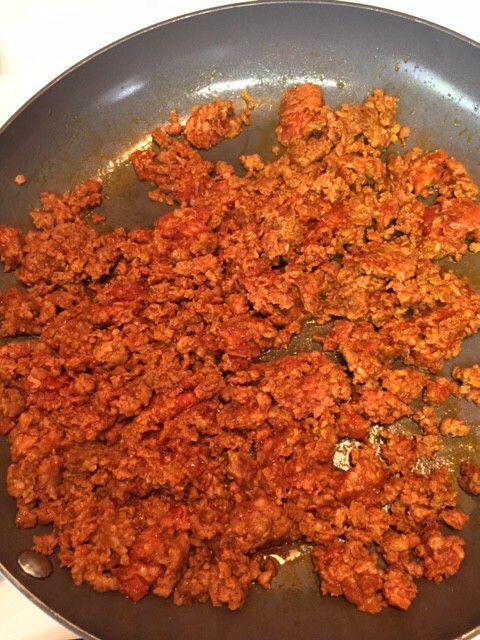 Return the skillet to the heat and add the spaghetti sauce and cooked pork chorizo, and mix together. 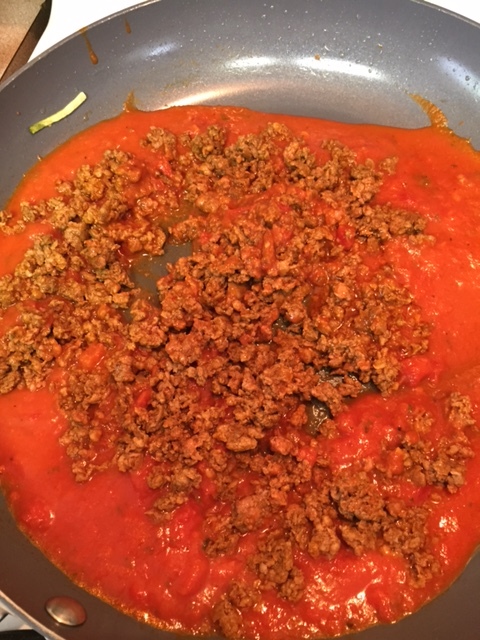 Allow the heat to warm the meat sauce. 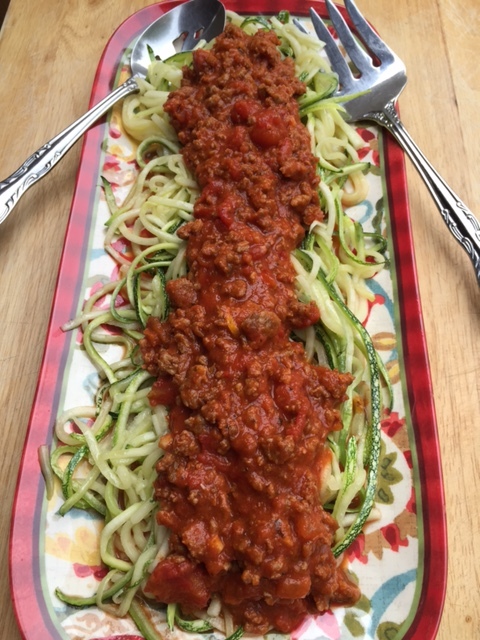 Remove meat sauce from heat and pour it over the squash pasta arranged on a serving platter. Serve with grated Italian cheese, and enjoy. This entry was posted in Main Dish, Pork and tagged Agaricus campestris, Back to School, Butternut squash, Butternut Squash Soup, Casserole, cream and vodka sauce, easy recipe, Flour, Grey squash, hybrid squash, low carbohydrates, low glycemic index food, Mexican squash, Olive oil, Oven, spaghetti sauce, spaghetti squash, squash varieties, stringed squash, Tortilla, trace minerals, Vegetable, vegetable pasta, vitamins, Zucchini. Bookmark the permalink.